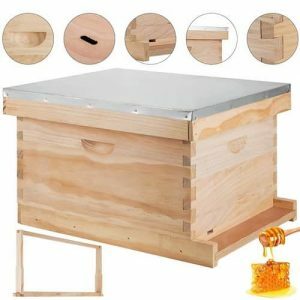 In this article we’re going to be discussing the top 10 beekeeping starter kits which exist in 2019, however, before we jump into exactly what products are featured in the list, we’re going to briefly talk about what exactly a beekeeping starter kit, or beehive starter kit, as they are most commonly referred to, actually is. We’re also going to briefly mention what the main advantages and some potential disadvantages to choosing a starter kit, in comparison to going out and choosing beekeeping equipment from separate sources. Therefore, let’s get to it, shall we! 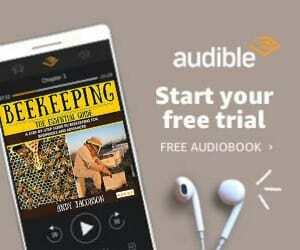 Where can I find the best Beekeeping Starter Kits for Sale? In Conclusion – Which Beekeeping Starter Kit is ideal for you? 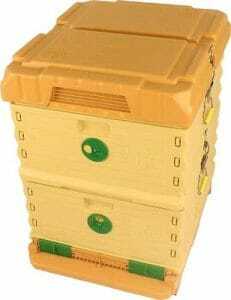 A beekeeping starter kit consists of a selection of beekeeping products, that are grouped together when sold, as they are deemed essential for the role of beekeeping. Hence, this makes an all-in-one beekeeper starter kit very appealing for new and aspiring beekeepers, who may not necessarily know all of the equipment they require. Note: With all of the starter kits below, we’ve clearly started all of the equipment which comes with each one. Ok, so we briefly mentioned the main advantage of using a beekeeping starter kit, which is that for new/beginner beekeepers, it’s extremely convenient and some might even say safer, to purchase a starter kit, as it’s simply got all of the essential pieces of equipment that you’ll need. Additionally, by purchasing a beekeeper starter kit from a particular brand, it ensures that all of the equipment is compatible with each other (although this is a double-edged sword as you can see later from one of the disadvantages). 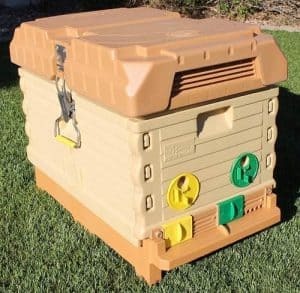 Some would argue that most beekeeping equipment have very similar size and shape designs, and so most of it will be compatible, but it’s nice to be sure of this, especially before you buy all of the equipment… You simply don’t want the additional hassle of packing it all up and having to return the items. Now for the disadvantages (there aren’t many), but there is a major one, especially if you’re not a beginner. 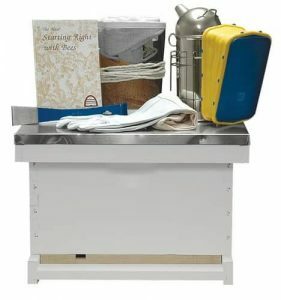 The simple disadvantage to using a beekeeping kit is that you have no control over what equipment is included within the kit, and because brands will only feature their own products, it means that you may miss out on getting the “best” equipment possible, where combining equipment from different brands may be a better solution. However, this is all theoretical… Make no mistake that beekeeping & beehive starter kits are a fantastic solution for new/aspiring beekeepers, if you can find the right one… And that’s where we come in. Below, we’ve only featured beekeeping starter kits with the best customer review ratings, and because we realize that price will most certainly be one of the most important factors, we’ve arranged the product list from least expensive (at the top) to the most expensive (at the bottom). Therefore, without further ado, let’s talk more about what are the best beekeeping starter kits. The Happybuy beekeeping starter kit is ideal for the beginner beekeeper who has a few DIY skills, and wants to start beekeeping on a budget. The bee box and frames are made of high-quality pine wood, with near to zero knots, which is fantastic. The wood itself is strong and corrosion resistant; Although it’s advisable to treat this wood with preservative, preferably one without chemical additives. The kit itself requires the assembly of the box itself, along with the frames. And reviews suggest that the hive can be a little challenging to put together, with some customers suggesting that although the supers go together easily, the brood boxes are more challenging to construct. Therefore, as we suggested, this kit is more suited to someone who’s a little more experienced in woodwork and DIY. If that’s not you, then take a look at a pre-assembled one, such as the next beehive kit that we’ve featured in the list. We would ideally like to see Happybuy release a construction video demonstration, so that we can feature it on our website, showing our readers exactly how to put this starter bee hive together. This is an extremely affordable beekeeping starter kit. However, based on previous customer comments, we suggest that you only consider this unit if you’re somewhat comfortable with DIY, as we’ve heard mixed opinions with how easy/hard it is to put together! Despite this, the unit has only got extremely good reviews, and therefore is an ideal solution for the beekeeper looking for an inexpensive beehive kit. The only downside is that you’ll need to paint/treat it, and purchase some additional equipment, which includes a few tools and safety protection gear! Therefore, if you’re not keen on painting, check out the next beehive kit in the list. Otherwise, this a great solution to purchase, particularly because this honey hive starter kit is so affordable! The Mann Lake Complete Beehive Starter Kit is the perfect solution for any beginner beekeeper. It includes everything you’ll need to get your hive up and running, including the top cover, inner, body, frame, entrance reducer and solid bottom. The hive itself comes with an unpainted 10 frame hive body, with 10 wooden frames which have a yellow waxed RiteCell foundation. The hive measures to approximately 22-inches in length, 18.5 inches in width and 13.2 inches in height. This is a very simple beekeeping starter kit, ideal for the beekeeper who’s looking for a solid, perfectly capable beehive. For the price, it’s fantastic value, as sourcing the products and creating this yourself would cost nearly as much (when taking time into account). The only downside is that you’ll need to paint it, and purchase some additional equipment, which includes a few tools and safety protection gear! If you’re not keen on painting, check out the next beehive kit in the list…Otherwise, this a great solution to purchase! The Mann Lake Complete Starter Kit is the perfect solution for any beginner beekeeper. It includes everything you’ll need to get your hive up and running, including the top cover, inner, body, frame, entrance reducer and solid bottom. The hive itself comes with a painted 10 frame hive body, with 10 wooden frames which have a yellow waxed RiteCell foundation. Similarly to the last beehive (HK160), the HK170 also measures to approximately 22-inches in length, 18.5 inches in width and 13.2 inches in height. The only downside is that you’ll need to purchase some additional equipment, which includes a few tools and safety protection gear! Otherwise, it’s a great solution to purchase, and you don’t need to paint anything! 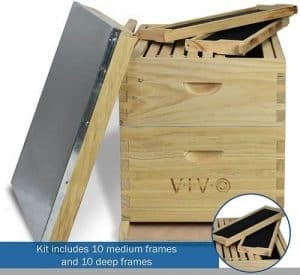 The VIVO complete 20 frame bee box starter kit is ideal for both beginner and more experienced beekeepers alike… with the 20 available frames, this Langstroth beehive is capable of supporting a growing colony, more so than a 10 frame hive would. Therefore it means that you don’t have to worry about the bee colony outgrowing the hive, which is certainly a danger if there are too many bees consuming a limited amount of honey over the winter period. The hive is made from Pinewood, and therefore it requires either painting (with a chemical-free paint) or treating with a wood preservative, to ensure the longevity of its use. 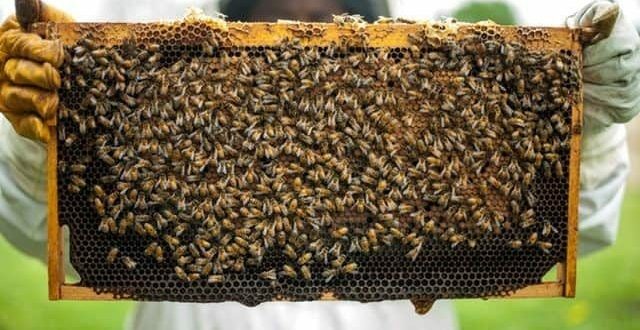 It comes with 20 frames, 10 are medium sized (6.25″ x 19″) and the other 10 are deep frames (9.2″ x 19″), and telescopic roof which is essentially a metal sheet to allow for both easy access, and protect the bees from the elements. The VIVO beekeeping starter box kit is the cheapest 20-frame unit that we’ve found, which has fantastic reviews. Therefore, if you’re looking for a hive with a larger internal capacity, whilst being priced very affordable, this may be for you! 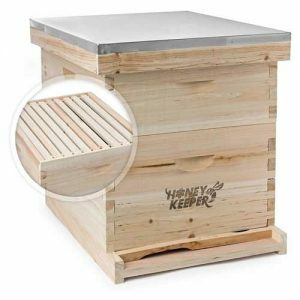 Additionally, the only downsides of this honey bee starter kit is that it the hive requires assembly, (although the manual looks fairly simple to follow, we’ve also featured a video of the hive being put together below), wood treating and you’ll also need to purchase some additional equipment, which includes a few tools and safety protection gear! Otherwise, we can’t fault this hive, it’s a brilliant solution. The Honey Keeper 20 frame Langstroth Beehive starter kit is similar to the VIVO BEE-HV01, being ideal for both beginner and more experienced beekeepers alike… with the 20 available frames, this hive is capable of supporting a growing colony, more so than a 10 frame hive would. The hive is made from Pinewood, and requires either painting (with a chemical-free paint) or treating with a wood preservative, to ensure the longevity of its use. It comes with 20 frames, 10 are medium sized (6.25″ x 19″) and the other 10 are deep frames (9.2″ x 19″), The hive has a galvanized metal capped telescoping rooftop, and so it will protect your colony from harsh weather. This hive kit is very similar to the VIVO BEE-HV01 solution, and is one of the cheaper 20-frame units that we’ve found which have solid customer reviews. Therefore, if you’re looking for a hive with a larger internal capacity, whilst being priced very affordable, this may be for you! 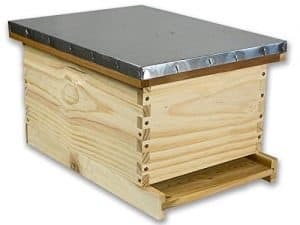 The Apimaye 7-frame beehive starter kit is ideal for the absolute beginner, with the fact that it comes fully assembled, and does not require painting nor any material treatment of any kind… This is also a very attractive option for a more experienced beekeeper who just doesn’t want to spend so much time on the prerequisites of starting a beehive, instead of on actual beekeeping. However, as the hive starter kit only contains 7 frames, it’s not the largest unit and therefore might not be sufficient for large, growing colonies; However, it’s certainly ideal for a new colony. Similarly to the other Mann Lake beehives, the HK170 also measures to approximately 22-inches in length, 18.5 inches in width and 13.2 inches in height. You’re getting a lot of equipment for the amount that you’re paying, and hence we think that its a great option, and from looking at the Amazon reviews, the customers think this way too! The Arboria beehive starter kit is an ideal hive for any beginner beekeeper, as it comes with everything that you’ll need to get started beekeeping. The unit itself is fairly easy get-up and running with, as is comes with the metal top, inner cover and bottom board already preassembled. Additionally, the hive box, frames and foundation requires assembly, but come with easy to follow instructions. The wood is good quality and does not split when nailed. Additionally, the joints go together very easily, and altogether it’s a pretty painless experience. We would advise that you treat the wood with a chemical-free preservative, to ensure the longevity of the hive. 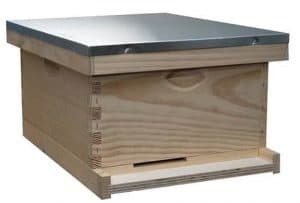 A nice feature of the Arboria beekeeping starter kit is that it can be expanded with additional frame boxes, making it ideal for the beekeeper who potentially wants to increase the colony size without splitting the hive. This particular beehive starter kit has some great customer reviews, and is perfect for the beekeeper who doesn’t mind assembling certain parts of the hive, and sealing the wood with preservative. Considering the price, we think that you can get more value from the Mann Lake or Apimaye beekeeping kits, that are cheaper. However, take a look at both of the product reviews, as this will allow you to make an informed decision. 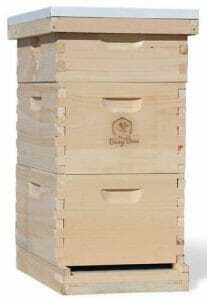 The Busy Bee’s -n- More beekeeping starter kit includes an 8-frame Langstroth bee box and frames, constructed from high-quality pine. The kit comes with 16 deep pre-cut frames, 8 super pre-cut frames, matching waxed foundations with hexagonal shaped foundation surfaces, an inner cover, screened bottom board, entrance reducer and a metal capped telescoping top cover. Additionally, the hive is relatively easy to assemble, taking a couple of hours; It also comes with a 4oz bottle of Titebond II exterior wood glue, although if you purchase this kit, be sure to get some additional bottles of this glue, as the Amazon reviews indicate that the glue is not always provided in the kit. It’s also apparent that some customers have had issues with some of the hive pieces not fitting together well enough; This could be due to a shipping/delivery issue, so if you have a wood clamp, we advise using it to straighten any pieces out. Based on the price of this beekeeping kit, and its large size, we think that it’s a great unit for those beekeepers who require a larger unit, so if that’s you, take a look at the price on Amazon via the link below. The Happybuy 2-layer beehive box starter kit is an easy-to-use ‘Auto-Flow’ honey beehive. 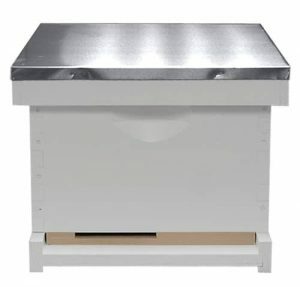 The combination of the unit’s clear end-frame view and Auto-Flow functionality mean that you can see when the honey is ready to be harvested, and this can be done without opening up the hive and disturbing the bees… Making it extremely ideal for new/beginner beekeepers and more experienced beekeepers alike, who may have multiple hives to take care of. Not only this, but it also means that you don’t need to purchase expensive honey extraction equipment, with it being as easy as turning a key, and watching the fresh honey flow right into your honey jar. Now, the 7-piece unit is more expensive than other beehive kits featured within the list, but you’re paying for convenience here. Based on the reviews of this beekeeping kit, its clear that the majority of customers are very happy with their purchase. Although what we’ve heard as a general consensus regarding Happybuy hives is that the boards can sometimes be a little difficult to put together. Although these customers have also said that once assembled, the hive is fantastic. Additionally, the Autoflow frames are expertly manufactured, and work extremely well. Therefore, if you’re looking for a 2-Layer, 7 pc Auto-Flow hive, this beehive kit may be ideal for you! The Happybuy 3-layer beehive box starter kit is an easy-to-use ‘Auto-Flow’ honey beehive. Based on the reviews of this beekeeping kit, it’s clear that the majority of customers are very happy with their purchase. Although what we’ve heard as a general consensus regarding Happybuy hives is that the boards can sometimes be a little difficult to put together. Although these customers have also said that once assembled, the hive is fantastic. Therefore, if you’re looking for a 3-Layer, 7 pc Auto-Flow hive, this beehive kit may be ideal for you! 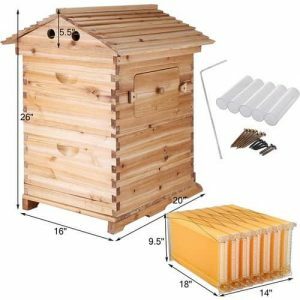 The Apimaye 10-frame beehive starter kit is ideal for the absolute beginner, with the fact that it comes fully assembled, and does not require painting nor any material treatment of any kind… This is also a very attractive option for a more experienced beekeeper who just doesn’t want to spend so much time on the prerequisites of starting a beehive, instead of on actual beekeeping. Now before we provide our opinion, we realize that every reader will have a different budget, and different requirements from a beehive starter kit. 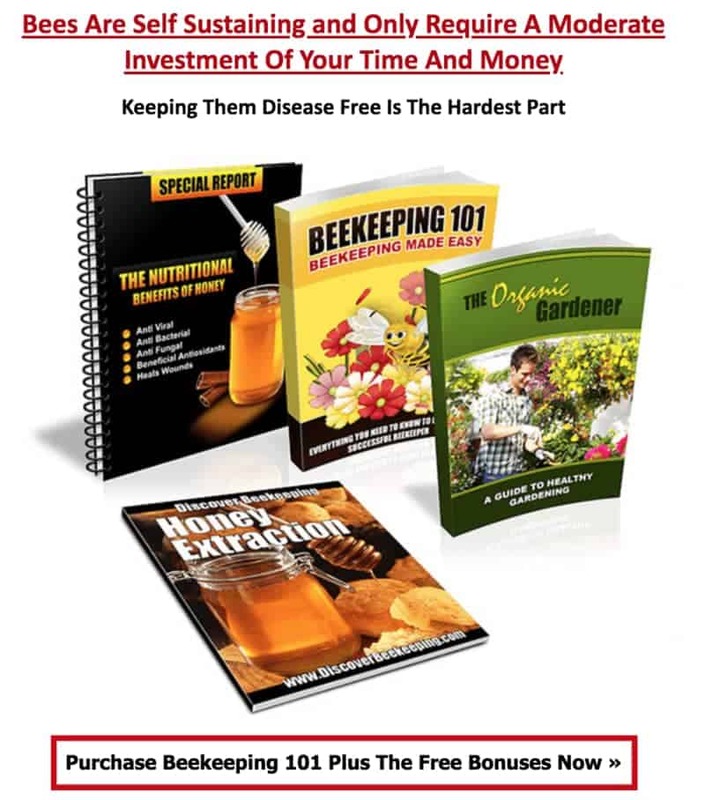 However, taking into account that the typical person looking for a beekeeping starter kit is most likely a beginner, and wants to start with a kit that doesn’t cost too much money, and also allows them to hit the ground running instead of fussing around with assembly and applying preservative, we think that the most ideal beekeeping starter kit is the Mann Lake – Basic Beekeeping Starter Kit (Check Price on Amazon), as it comes pre-assembled and painted; Along with a selection of essential beekeeping equipment. We hope that you’ve enjoyed our article on the best beekeeping starter kits of 2019, and are ready to begin your beekeeping journey!